You may recall that, as part of its first birthday celebrations, Datonomy hosted a screening of data protection documentary Erasing David. As guests munched and crunched their popcorn, hotdogs, ice cream and sweets they were treated to a rare find: a film at once entertaining and eye-opening (see Datonomy’s review of the film here). If you missed this munching, eye-opening extravaganza – all is not lost. Erasing David will be screened on Thursday 29 April 2010 at 8.30pm, ahead of its broadcast on More 4, on 4 May 2010, in cinemas across the UK (for a full list see here). The best experience is to be had at the London Ritzy cinema in Brixton, where a post-screening debate will be held (beamed live to the other cinemas). Among those taking part in the debate are the film’s director David Bond, its writer Will Self, David Davis MP, Head of Liberty Sharmi Chakrabarti and Michael Nyman, who wrote the score for the film. 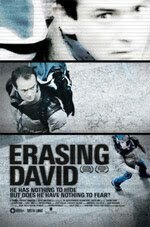 For the uninitiated, Erasing David is a “documentary about privacy, surveillance and the database state”. Filmmaker David Bond, alarmed that a government body had lost some of his personal details, embarked on a project designed to test the extent of the surveillance state. Bond decided to “disappear” for a month, hiring private investigators armed only with his name to track him down. This chase is interspersed with interviews with, among others, David Davis, Timothy Garton-Ash and Helena Kennedy, as well as some “victims” of data theft and mistaken identity. The film makes compelling viewing. Most striking for me was the image of Bond surrounded on his study floor by tall stacks of paper representing the information that the government and private companies hold on him and his family. Also striking was that, despite the ever-advancing sophistication of location-based services and applications, Bond’s investigators found most success in decidedly “low-tech” methods such as trawling through rubbish. Erasing David will undoubtedly inspire many to be more aware of the information they disseminate, but it also demonstrates that even the most savvy data subjects leak data wherever they go. Short of digging a hole in a forest and taking up residence, the best we can do is think carefully about the data we share, and its recipients.